Are you dreaming about a relaxing all inclusive yoga holiday in the Italian countryside this summer? Does the prospect of a week in a traditional 13th century country house with pools, healthy traditional Italian food, yoga classes and ayurvedic therapies fit in the picture of your perfect holiday? Share with us a special occasion to practice yoga with joy, listening to the self and to others. Enter into harmony with the beauty of a place, which words can barely describe, surrounded by the peaceful green energy of the Umbrian hills. We have created a unique experience in this enchanting countryside by offering a relaxing week with a choice of activities that allure your body and mind to come to their natural state of rest. 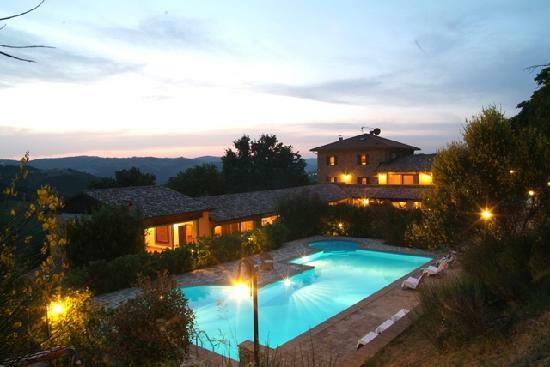 Possibility for two yoga practices daily (ashtanga and hatha), excursion to Assisi, the home of St Francis, ayurvedic massage treatments, meditation, workshops in wellness and ayurveda are offered every day to create a unique week you’ll remember forever. Come to relax, enjoy good company and tasty food with a chance to learn how to make the benefits when back home. We start the day with an outdoor meditation session and move to a yoga practice indoors. We teach ashtanga viniyasa yoga in Mysore style, which is suitable for all levels of yoginis and, which enables us to give one to one assistance to single students during practice. Teaching is done in both English and Italian. We suggest you bring your own yoga mat. After yoga you can break your fast with delicious Italian food, sourced from the neighbouring land, all organic and vegetarian. Until lunch there is free time to enjoy the outdoors for walks, great pool area and maybe have an ayurvedic body treatment or consultation. Lunch is the main meal of our day. We’ll sit down to heat healthy lacto-vegetarian food with vegan options available. Simple and delicious Italian food is made only using fresh ingredients and perfect for enthusiastic locavores. You’ll have good time to digest your food before we start our afternoon session be it yoga, meditation, nutritional advice, pranayama (breathing exercises) or ayurveda. On Monday we will organise a visit to Assisi, the home of St Francis and it’s world famous Chapel. This stunning town, which gives an opportunity to enjoy art and architecture of pre-renaissance Italy, eat out and also do nice shopping in the tiny boutiques of the old town. Everything we offer in our program is optional for you to take part in. We don’t mind if you miss a session and want to sleep in. This is your time and with the program we’ve designed we give you a chance to wind down and give the body and mind a greater chance to rejuvenate and replenish. Activities in the program are free of charge except ayurvedic treatments and consultations. There will be a treatment list for pampering body treatments and relaxing and deep tissue body massages. In an ayurvedic consultation you will be able to get a diet and lifestyle program that you can take home with you and continue enjoying the effects of health, relaxation and wellbeing. Check out the treatment list here and start booking already now as there is limited availability. We enjoy another meal in the evening after which we will gather together for a session of light entertainment with music, chanting, a film or meditation. On the day of the arrival, as people will be arriving at different times, there is lunch and free time to get settled in the rooms and to get to know the place. At 5pm we have a welcome session to get to know each other and to talk about the retreat program. We reserve the right to small variations in the schedule. If any, they will be communicated at the arrival to the location. The retreat runs from Thu 16th to Wed 22nd Jul, costs below. Early bird discount €50 if you book before the end of March. The prices include full-board, teaching and workshops. Massages, flights and transit to the retreat centre are extra. Ryanair flies to Perugia direct and cheap if you book well in advance. We can organise a transit from airport to the centre at an extra cost. The payments are made in two instalments. A deposit of €300 is paid at booking. Deposit is taken in good faith and is non refundable. The second payment is required to be paid directly to the venue 4 weeks before your holiday at latest. In order to take part it is necessary to complete and send the enrolment form. Please emailanu@jivitaayurveda.com and we will send it to you with bank details for payment. You are kindly requested to take out separate travel insurance before you come to our retreat. Next In interview with… Prathamesh Karpe, Ayurvedic doctor in Goa !